They're more likely to be aerated blocks, rather than concrete*. If they aren't, the next most likely is an aggregate block, of reduced thermal efficiency, containing all sort of recycled stuff inc crushed glass. Concrete blocks are actually something of a rarity. *There is some cement in an aerated block, but they aren't made with aggregate/ ballast. Wellllll, if you want to be specific about it they're usually autoclaved aerated concrete blocks and you're both right. Or jsut say "Thermalite" and be done with it. I have no problem with the admonition, but I have yet to hear any, I repeat, any alternative hypotheses. There are only going to be so many possibilities short of invisible sky daddy wrath. With the expertise here in the thread, let's hear it. The distinction being that concrete contains multiple sizes of material, with both fines and coarse. The stuff which a Celcon/ Thermalite block is made of doesn't contain any coarse material, so I think we could settle in the middle for "cementitious". None of that is particularly hard to understand. In the US, the rule seems to be that if you remodel the house or building, you have to bring it up to the current building codes. Yes, really. I don't recognize your authority to shut down discussion here. If you have something to contribute, other than "everybody shut up! ", then contribute. Yes, I'm a little uncomfortable with this a well. Traditionally, here on the ISF it's been all about the speculatin'. China blast, Tehran highrise, Malaysia Airlines 777 Pt. II (the now infamous "barnacle" thread) all free flowing speculation. Was it productive? Difficult to answer. For instance, in the barnacle thread, whilst researching the aforementioned barnacles, I learned that a certain deep sea fish is preyed upon buy another deep sea crustacean which attaches to its tongue causing the tip to wither away and the parasite eventually becomes a surrogate tongue! So, in a thread like this, I think it's important to remember the "little" guys in this world who are keepin' it real even while being a fake tongue. I'm assuming your tongue is firmly in cheek. Wow, at 3 minutes the outer cladding catches fire and from there shoots up the building reaching the roof in 1 minute 30 seconds. That is one telling video. This is turning into a fascinating thread. Thanks, MikeG and Architect, for your contributions. Not really, I'm afraid. We need to know how did initiation occur and why did passive features such as class 0 surfaces and cavity barriers/fire stops not arrest the spread. I'll come clean, I checked the BBA for the right terminology. Last edited by Architect; 15th June 2017 at 01:10 PM. Last edited by dudalb; 15th June 2017 at 01:19 PM. It depends on where in the US you are talking about. Fire standards are NOT a Federal responsibility,but a state/local responsibility. There is quite a bit of variance. I'll defer again, then. To you and the BBA. In all fairness I think there's five of us: myself, MikeG, Jerry, Newton's Bit, and BasqueArch. Three architects, two engineers I believe, all with experience in design and delivery of tall structures. Doubtless someone will try to claim that we've not substantiated those qualifications, however I think that the technical posts made (most notably on the 911 threads over the years) speak for themselves. I have a number of years (40) experience in the application and design of fire suppression systems - sprinklers, standpipes etc. As none were present in this building I am remaining silent but I do appreciate the contributions from yourself and MikeG. I can say that while fire suppression would be mandatory in any such building constructed today or in the recent past, codes were quite different previously and the building was likely code compliant at the time it was built. I'm assuming that you might not be in the UK (apologies if you are) but one of the principle issues of routing of pipework, is the space require for tank storage and pumps given that the UK fire authorities seem reluctant to consider mains-based systems. I appreciate that the latter is not always practicable, especially in parts of the south where supply and pressure are less certain, but having watched what I would call "swimming pools" having to be accommodated on recent(ish) projects for straightforward buildings it's certainly a difficult juggling act. Incidentally they're compulsory in Scotland on buildings over 18m, or roughly 6-7 storeys in height. My own view is that such systems still have to form part of a coordinated suite of passive measures to control fire within any property. Fire stopping of cavities, for example, remains important in overcladding systems as does provision of adequate escape routes. I was involved in fire safety on buildings in the (Scottish) government estate following the findings of Windsor, including developing fire action plans. Some were real eye-openers, I can tell you, and that terrible (but fortunately low casualty) case caused a real review within the heritage sector as to how we would deal with our most historic building stock. Now, perhaps, we will see something similar for social housing but let's see what the causes of this disaster are first. Well bear in mind that the implications of 911 are that there is now greater redundancy against dispropportionate structural failure on larger structures. Dashed shear walls all over the place. Yeah, shear walls are a pain when looking for clear routes for vertical pipes. But they seem to get priority over the plumbing every time. My own view is that such systems still have to form part of a coordinated suit of passive measures to control fire within any property. Fire stopping of cavities, for example, remains important in overcladding systems as does provision of adequate escape routes. Located in Canada, not the UK. It surprises me to learn that mains based systems are avoided there. Here is is the standard. We only use stored water at remote sites where the main supply is too small. The Greater Vancouver area has a good public water supply volume and pressure - most buildings have pressure reducing valves to door the pressure for use in low rise buildings. Of course we use fire pumps to boost the mains pressure for high rise buildings. Sprinkler systems up to about 6 storeys are commonly supplied by mains pressure only. I completely agree that fire separations and fire stopping are important parts of building construction. It is the combination of containment and suppression that makes a building safe. Some of us non-professionals who live and work in high-rise buildings think a sudden conflagration like just shouldn't be possible under any circumstances, even if it means that the buildings won't get to wear a shiny plastic gown. I have located the Post Incident Report from a tower fire in Melbourne, Australia back in 2014 (Lacrosse Docklands), where the cladding was involved in spreading the fire, the material in question called (Alcuobest) was tested, but proved so flammable that testing had to be abandoned due to fear the test equipment would be damaged. That report is linked below. I have said several times that the lack of fire barriers between flats was a serious problem. Building code for new construction in this city requires 30 minute burn through time IIRC. So, alternative hypothesis: building design plus inadequate fire barriers led to a flue situation, sucking the fire rapidly through the building. I'm not sure how ignition matters unless arson is suspected with an accelerant. The latest news report once again proves the rule I learned from watching Air Crash Invesigations, cost cutting should never be allowed to compromise safety. Fitting fireproof cladding to the London tower that became engulfed in flames would have cost just $3 more per panel than the cladding used, it has been claimed. One of the ways the Fire Marshall's people check them is with a can of compressed "smoke". Being aerosol, it is unlikely to be warmer than ambient air temperature. UL rated. Not particularly esoteric. There are several different manufacturers. Anyone can buy a can. A bit over $8 at places like Walmart. I note from the linked ad that the recommended operating temps for the product are 50 to 95°F. So they don't even want it to be hot when you use it. It's at least possible that the fire resistant panels were actually specified, and the contractor substituted the cheaper stuff. It's certainly happened elsewhere. You are correct that there is no Federal Fire Code standard. However the NFPA-1 National Fire Code has been adopted wholesale by an ever increasing number of states, and where it hasn't been it is commonly used by local and regional jurisdictions. Those which don't specify it outright often base their own on it, and carve out any exceptions they want to preserve. Its use has been becoming ubiquitous over the past few decades, much like the same organization's NFPA-70 National Electrical Code, which is not only the adopted standard for just about every state in the U.S., but is also widely used in the rest of the world. There is some minor variance in Fire Codes in some jurisdictions, yes. But certainly not "quite a bit". It isn't the Wild West. Last edited by quadraginta; 15th June 2017 at 09:26 PM. I posted about that earlier upthread. Like i said then, not all such panels are created equal. So the specific product is a critical element in the assessment. The Grenfell footage did look a lot like the panels in question were the sort that used what amounts to napalm precursors for their insulation material. Like the ones at Lacrosse. This is correct. It's heat that sets off sprinklers. For a fire alarm, you don't want to wait until there is heat to ring an alarm. That would be too late. That what was suspected in the Lacrosse Apartments fire in Melbourne Victoria, Australia I posted about earlier. Australian regulations forbid the use of non-fire retardant cladding in buildings over a certain height. However they were unable to prove it because documentation was lacking. This is not proof of dodgy behaviour, though they found inadequate documentation was rife in the construction industry. Even when building/fire codes and regulations are adequate they are useless without effective oversight and inspection. Many construction supervisors welcome inspectors for that reason. They can't keep up with every detail. "The more eyes the better." is a good rule to build by. We had one Durham County electrical inspector who was a legend in his own time. (And I mean this literally.) Most electricians who dealt with him said that he never failed to teach them something about their trade they didn't know..
And if there was a problem they weren't sure how to address to stay code compliant then he actually enjoyed being asked what to do rather than deal with well-meant but ill-advised attempts to solve the problem on their own. The flip side was that if anyone in the trade ever tried to hide anything from him then their future as an electrician in that county was, for all practical purposes, over. Here's something you'll appreciate, Architect and Mike B. He was insistent on seeing both side of any electrical device installed in any wall, even if it was just a switch box. Builders quickly learned after their first encounters with him that he would cheerfully make them take the drywall off of one side of any wall that they had closed up both sides of if he hadn't inspected the wall before they did. We had to coordinate a sign-off procedure between the electricians and the drywall contractors so that they wouldn't button up anything prematurely. That gradually morphed into a system where every trade had a paint color which they would use to sign off on the walls by marking each stud. That way, if drywall had to come down, it was easy to tell whether it had been closed up prematurely or if someone had just forgotten to put something in. Saved a lot of arguments between subs about the cost of taking boards down and putting them back up. In lab buildings this could be a big deal, because there was equipment and material that more than a few different contractors were responsible for installing, and the drywall hangers were often subs of the subcontractor, being paid by the board. They could get a bit over-enthusiastic. Last edited by quadraginta; 15th June 2017 at 09:24 PM. So many places for things to go wrong. The panel system specified might not be compliant with local requirements. The panel system specified might not be the product which actually gets used. The installation procedure actually used by the builder might not conform to the requirements specified by the manufacturer to achieve the desired fire resistance, even when the spec'd panels were used. Local requirements may not even properly specify an adequate performance by the products they allow. I'm just puzzled why if you are prepared to spend millions on making it look better, which you don't have to do, you can't spend millions on making it safer just because you don't have to. The money spent on making it look better was not what was asked for by the residents. They asked for safety. It's pretty simple. It's about return on investment. The money spent on extra "Ohh, shiny!" lets them gin up higher profits from new customers. Making the customers they already have safer doesn't put a dime (Groat? Ha'penny? Farthing?) in their pocket. As long as they don't get called to account for their neglect and shortcuts and made to pay recompense later. But that doesn't seem to be a problem they feel a need to anticipate. In this particular case the building is public housing ("council estates"). They aren't trying t attract customers; they likely have a long waiting list. That doesn't mean the operators didn't make a shady deal with the contractors, or the contractors didn't cut corners wherever they could. My English friends say it's "fortnight." .....We had one Durham County electrical inspector who was a legend in his own time. (And I mean this literally.) Most electricians who dealt with him said that he never failed to teach them something about their trade they didn't know..
That describes most Local Authority Building Inspectors I know pretty well. I learned more from them on the technical side of building than I did from University, by many a long mile. I think this an unfair accusation. 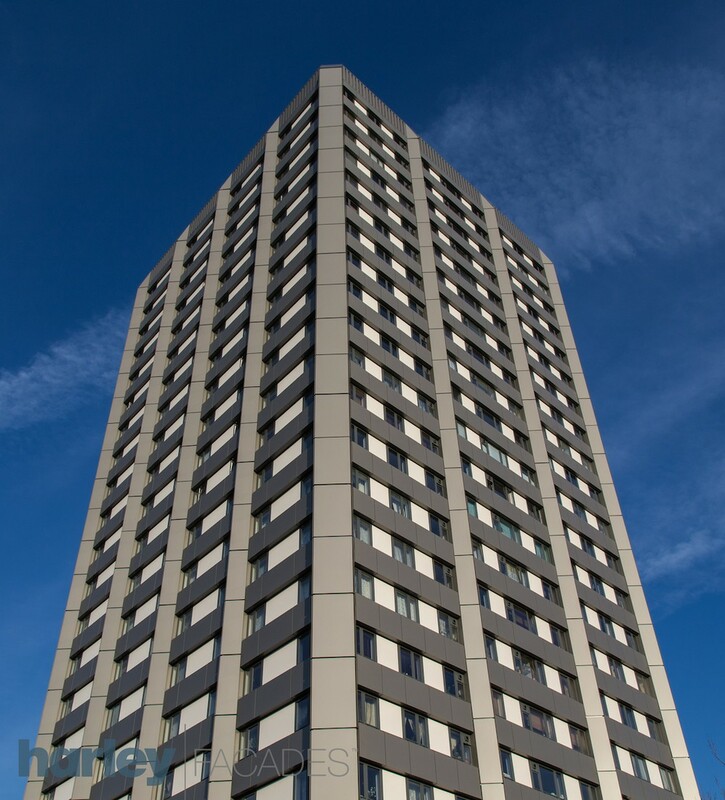 The motivation for the building work was to bring an uninsulated or poorly insulated tower up to modern standards of thermal performance. You can only practically do this with external insulation, and you have to cover that insulation with something. It certainly wasn't a question of tarting up an eye-sore just for the sake of aesthetics. But not modern standards of safety. We really don't know that yet. Last edited by MikeG; 16th June 2017 at 12:01 AM.